Environmentally friendly ball pen manufactured from recycled cardboard and corn starch complete with a built in highlighter. 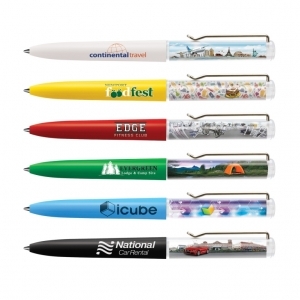 A useful and practical pen with 3 self contained refill colours. 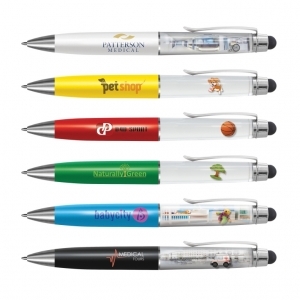 Metal rollerball pen with stylus to use with your touch screen phones, iPods and ipads. 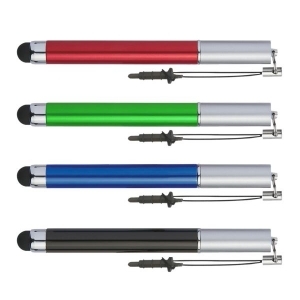 Smart aluminium mini stylus for use with touch screens which plugs into an audio jack so it is always close at hand. 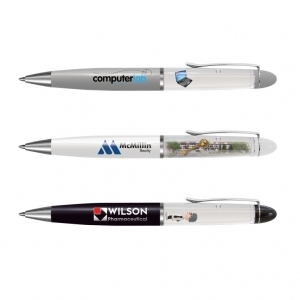 Plastic and metal liquid filled floating action ball pen with a twist mechanism, a stylus for use with touch screens and the choice of a Blue or Black ink refill. 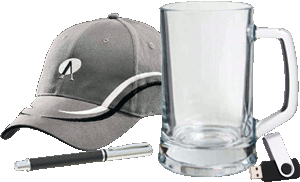 Brass barrel, liquid filled floating action ball pen with a twist mechanism and the choice of a Blue or Black ink refill. Plastic and metal liquid filled floating action ball pen with a twist mechanism and the choice of a Blue or Black ink refill. 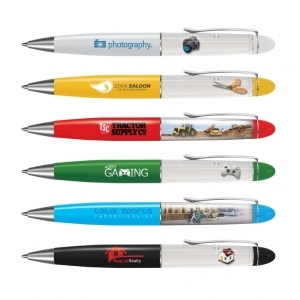 Plastic liquid filled floating action ball pen with a twist mechanism and the choice of a Blue or Black ink refill. 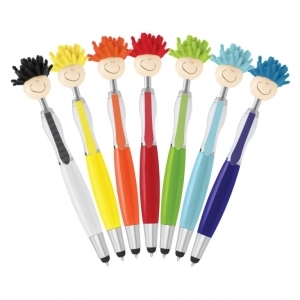 Fun retractable plastic and metal ball pen with a smiley faced head on top of the push button. It features colourful microfibre "hair" which is used for cleaning screens and a novel printed clip in the shape of a tie.